There are many yoga poses with animal names. It's only natural, as the early yogis were influenced by what was around them. Animal named yoga poses are common in many yoga traditions. This pose is also known as adho mukha svanasana. Perhaps the most well-known of the animal-name yoga poses, downward-facing dog is a staple yoga pose of many yoga classes. This animal pose can easily be incorporated into a yoga flow series-for example, into sun salutations. Downward dog is a great posture to increase flexibility and to help release tension and stiffness. Also called bidalasana, cat pose is an important one for increasing spine flexibility and can help with relaxation if you practice deep breathing while coming in and out of the pose. Cat pose is also a nice pose for beginners because it does not require balance and allows every yoga practitioner to stretch only to the extent of where it is comfortable for him or her. Sometimes called matsvasana, fish pose is one that is frequently seen in yoga classes of the restorative type. Since it relieves congestion in the nasal passages, the pose can do wonders for yogis suffering from an illness. This pose is also called gomukhasana. A seated yoga pose, cow face pose should not be confused with cow pose, which is done on hands and knees. Cow face pose is a seated stretching pose in which the human body, with a little imagination, looks like a cow's face. This pose is good for the spine (posture) and stretches both the legs and the arms. 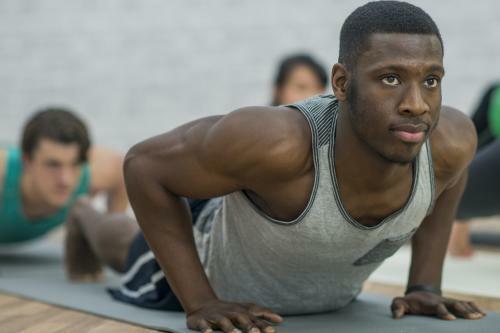 Called bhujangasana, cobra pose is completed with one's stomach on the ground. It is frequently practiced in flow yoga. An excellent pose to open the chest, cobra pose also strengthens the spine. Also known as ushtrasana, camel pose is a great pose for stretching the abdominals. This asana is one of the lesser known yoga poses with animal names. It is a kneeling backbend in which the hands reach the feet. A favorite pose of female yogis, turtle pose (kurmasana) is recommended for whittling away fat from the stomach. The pose gets its name from the fact that from above, the yogi looks like a turtle, with their nose to the ground and the arms sticking out the bottom and the legs sticking out the top. Sound difficult? It is, but it is still popular among women. Pigeon Pose (rajakapotasana) is a sitting pose that stretches the upper legs, increasing flexibility. It is found in many yoga DVDs and may be included in yoga classes as a gentle stretch. 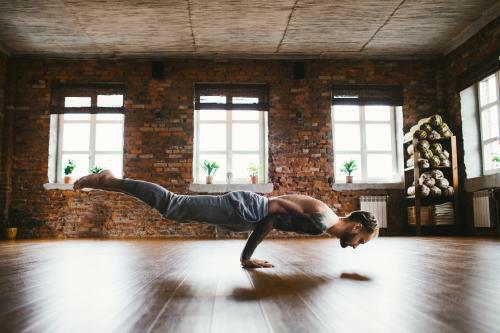 This pose is clearly a birdlike pose, as it requires considerable balance: your feet are off the ground and bodyweight is supported by the arms. Sometimes called Crane Pose, Crow pose is an invigorating and satisfying balancing act. Like crow pose, peacock pose (mayurasana) requires balancing on one's hands. Peacock pose also requires considerable strength because one's legs are extended, increasing the force needed to keep them up off the ground and extended. This pose is good for balance and strength but also aids the inner organs. Another animal pose that requires considerable balance, eagle pose (garudasana) is executed standing on one foot with the other leg wrapped around the bent knee of the supporting leg. Intertwining the arms in a similar manner completes this stretch for the upper body. 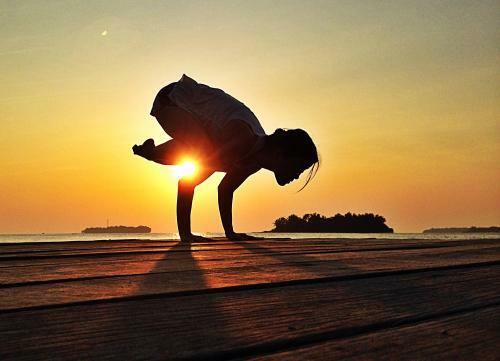 For another challenging balance pose, yogis can turn to scorpion pose. Instead of balancing on one's hands or feet, scorpion pose balances on the lower arms, with the legs bent over the body in the air. In frog pose (bhekasana), the legs are bent and placed to the sides of the body, much like a frog looks when it's ready to jump. An excellent hip-opener, this pose is adaptive to many skill levels. Crocodile pose (makarasana) is an excellent resting pose for relieving stress and tension. While this pose, which has you lying on your stomach with head down on arms folded at the elbow may not really resemble a crocodile, it is a fun yoga pose to teach children about yoga poses with animal names. While some of these poses are more clearly linked to their animal name than others, all these animal-named yoga poses are inspired by the actions or anatomy of the animals after which they were named. Visit Love To Know's Yoga Pose Gallery for pictures and details of these and other yoga poses.